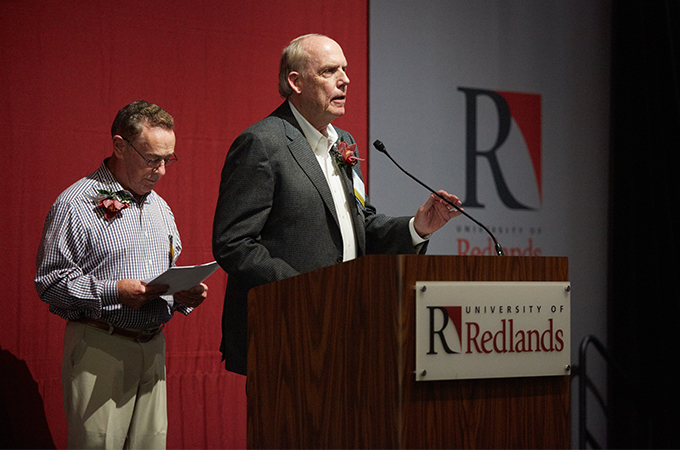 U of R Trustee Jim Schroeder ’65 (right) speaks at the Athletics Campaign launch event last fall. When I came to the University of Redlands in 1961, I didn’t know what I wanted to study, but I did know I wanted to play on the Bulldog men’s basketball team. Looking back, the experience of being a student-athlete is one that has remained with me and had a major impact on my life. 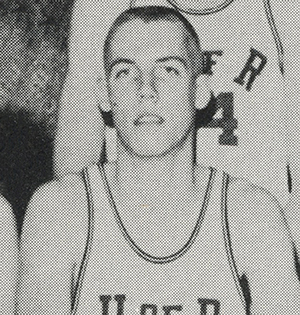 Schroeder proudly wears his basketball uniform during his student days at the University of Redlands. I played basketball at Orange High School in Orange County, and my longtime interest in the sport attracted me to the Redlands program. During my two and a half years on the Bulldog team, I had the pleasure of playing for the legendary Coach Lee Fulmer. In addition to refining my skills on the court, he taught me patience and perseverance. I started on the freshman team, which gave me an opportunity to enjoy a lot of playing time and also let me connect early on with incoming students with a basketball interest like my own. Academically, I subsequently found an interest in geology and geophysics, and, as I got into my upper-division classes, I found I had too many afternoon labs to get in sufficient practice time. I decided the situation was not fair to my teammates, the coaching staff, or me, so I took a step back from the sport so I could focus on my studies. Even though I wasn’t playing competitive sports anymore, I still felt the spirit of Bulldog Athletics. My brothers in Kappa Sigma Sigma had attended my basketball games, and I attended every meet and game I could in order to support them and the University’s programs. The experiences I had at Redlands, both academic and athletic, had an enormous impact on me personally, and I credit these experiences with my professional development and success. I gained a competitive edge, learned how to overcome adverse situations, and [began to grasp] how to bind various disciplines and personalities into effective teams. I forged friendships with teammates and fraternity brothers, many of whom I am still in touch with today. Several years after graduation, I was recruited by a Redlands alumnus—a former Bulldog water polo player—for a tremendous job opportunity in Los Angeles, which served as a turning point in my career. In my professional career, I have interviewed and hired many people, and I can often tell who has played intercollegiate sports—they see teamwork as a virtue, consider others’ viewpoints, are adept at problem-solving, and focus on strategic outcomes. When I was asked to serve as a co-chair for the Campaign for Bulldog Athletics with Tom Gilmer ’62, ’67, I knew right away I wanted to support this needed effort. With more than 25 percent of our College of Arts and Sciences undergraduates being student-athletes, it is so clear to me that Bulldog Athletics endeavors are as relevant as ever and play a very important role in the University’s overall recruitment of high-quality students. Bulldog student-athletes have higher retention and graduation rates since they are engaged in the campus community. Our outstanding coaching staff reflect the legacy of coaches like Coach Fulmer—they continue to dedicate themselves to their students, serving as mentors and helping them to become the best they can be. Just before we launched the campaign last October, Tom and I were invited by Coach Mike Maynard to the football practice field behind the Field House (the future home of our Bulldog Athletic Center). I saw student-athletes lifting weights under the bleachers, on the track with their coaches, on the football team practicing, and as part of the soccer team working out. The whole picture was amazing and reaffirmed the high level of interest and participation by the student body in the University’s programs. Coach Maynard had each of the senior members of the football team introduce themselves to Tom and me, with each young man shaking our hands and thanking us for our help with the campaign. It was a powerful moment, a moment I will personally not soon forget. When I reflect on our $20 million goal for this campaign, I think about those student-athletes we met on the field—how proud I am of these young folks and how they represent the qualities and values of the University. These programs are a necessity for our whole campus, not just the student-athletes and coaches. I have seen firsthand how Bulldog Athletics elevates the entire University community and how these programs support the quality of the University’s overall recruiting goals. I sincerely hope that others who also recognize the Athletic programs’ impact, either in competition or from the stands, join us in our efforts to upgrade our athletic facilities for the next generation. To learn more about the Campaign for Bulldog Athletics or to make a gift to support its projects, visit foreveryours.redlands.edu/bulldog-athletics/.